Rajnath Singh to inaugurate and lay foundation stones for NHs projects in Lucknow. In Uttar Pradesh, Home Minister Rajnath Singh will inaugurate and lay the foundation stones for 80 National Highways projects worth over one lakh crore rupees in Lucknow today. Road, Transport and Highways Ministry, in a release, said, Mr Singh will also inaugurate and lay the foundation stone for several works under Namami Gange programme worth over one thousand 969 crore rupees. The Home Minister will be accompanied by Road, Transport and Highways Minister Nitin Gadkari and Uttar Pradesh Chief Minister Yogi Adityanath.”The National Highways to be inaugurated include four-laning of Lucknow-Sultanpur section, four-laning of Kursi Road-Ayodhya Road section of Lucknow ring road which will decongest the traffic of Lucknow. Home Minister will lay the foundation stone for construction of Amethi Bypass and widening and construction of various important sections of highways in the State which also includes construction of 12 big and 40 small bridges. On the occasion, Mr Singh will lay the foundation stone for construction of the ambitious Lucknow-Kanpur Expressway project which will half the current travel time between these two big cities of the state. He will also inaugurate several projects under Namami Gange programme, including laying of sewerage network of over 214 kilometre in Prayagraj at a cost of over 260 crore rupees. Previous articleIAF airlifts 514 stranded passengers in J&K. 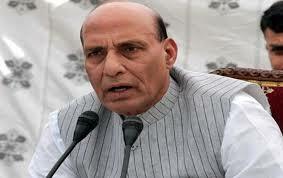 Next articleGovt is committed to improve working conditions & quality of life to CAPFs: Rajnath Singh.